Along with beliefs about particular games, I also asked respondents about their attitudes toward several game elements and common approaches to rules. I chose things for rating that I thought might have a strong positive or negative association with OSR, such as random encounters (positive), 3d6 in order for stats (positive), and balanced encounters (negative). Some of these things are central enough that people use them to inspire the names of blogs. For example: save.vs.totalpartykill.ca, tenfootpole.org, and Ten Foot Polemic. Middenmurk writes: 3d6-in-order transports you into an entirely different world. Every single one of these attitudes differs significantly between self-declared OSR participants and self-declared OSR non-participants. The predicted differences by group were more than a scale point for half of the items: 3d6 in order for stats (b = 1.48, 95% CI [1.29, 1.67]), Save or die (b = 1.31, 95% CI [1.11, 1.50]), Race as class (b = 1.26), Random encounters (b = 1.09, 95% CI [.95, 1.23]), Level drain (b = 1.03, 95% CI [.83, 1.22]), and Balanced encounters (b = -1.28, 95% CI [-1.45, -1.11]). In plain English, for example, this means that people who think of themselves as OSR participants on average Somewhat like 3d6 in order for stats, while non-participants are on the dislike side of Neutral. The average attitude across all attitude objects was higher for self-declared OSR participants than for self-declared OSR non-participants, but this is unsurprising given that I chose more attitude objects relevant to my associations with OSR play. I am unsure how to make sense of the result that OSR participants like Ascending AC more than non-participants. Maybe the non-participants have negative attitudes toward anything associated with Dungeons & Dragons of any stripe. I am open to alternative explanations though. Somewhat surprisingly (at least to me), everyone, even OSR non-participants, seemed to be positive about Random encounters and Reaction rolls, which are mechanisms that weave juxtaposed outcomes into surprising sequence of fictional game events. This leads me to believe that positive attitude toward play designed to produce emergent (as opposed to planned) narrative is a broadly shared preference. It seems that Railroading, Alignment languages, and Dice fudging are universally disliked, with Railroading being solidly in full Dislike territory across all responses. Perhaps the title I gave to the second figure is an overstatement, as slightly on the Like side of Neutral for Balanced encounters is hardly a ringing endorsement, but relatively speaking self-declared OSR non-participants like Balanced encounters a whole lot more than self-declared participants. I included one quirky item which I thought might represent a form of early D&D orthodoxy: attitude toward Alignment languages. The general reaction I have seen to the idea of alignment languages is either confusion or bemused contempt, with the occasional attempt to use the idea as a prompt for some creative (but almost always ironically satirical) world building. I rarely (perhaps never) have seen alignment languages actually come up in play any time recently. I am sure there are exceptions, but the point is that it seemed like a good candidate for looking at the attitude respondents might have toward something cumbersome but authentically Gygaxian. However, even self-declared OSR participants on average dislike Alignment languages. I interpret this reported attitude as some evidence that Gygaxian fundamentalism, or the regard for something solely based on the fact that Gygax did it, is less central to the meaning of OSR than many other elements in the constellation of meaning making up OSR. 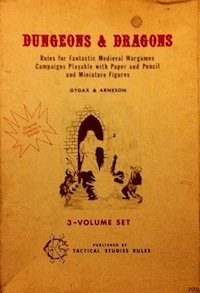 Similarly, while respondents generally agreed that AD&D was OSR (and to a greater degree among self-declared OSR participants: MOSR = 5.85, Mnon-OSR = 5.08), AD&D was rated less OSR than the games closer to Basic D&D in the set of games I presented. 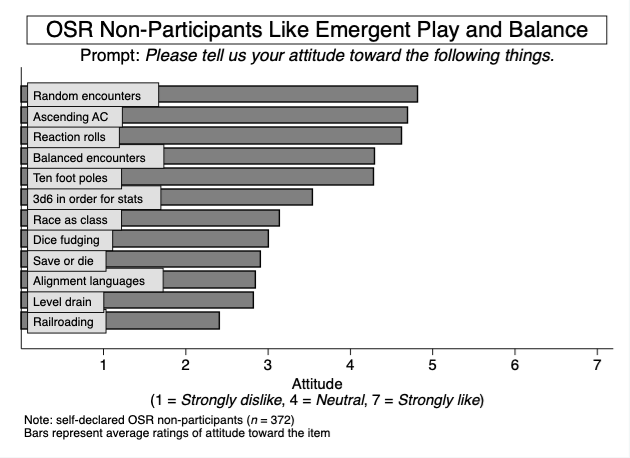 Based on these comparisons, it is clear that a set of distinct attitudinal preferences toward game elements at least distinguishes OSR participants from non-participants, and perhaps underlies the division. However, the attitudes differ in ways that are somewhat counter-stereotypical. 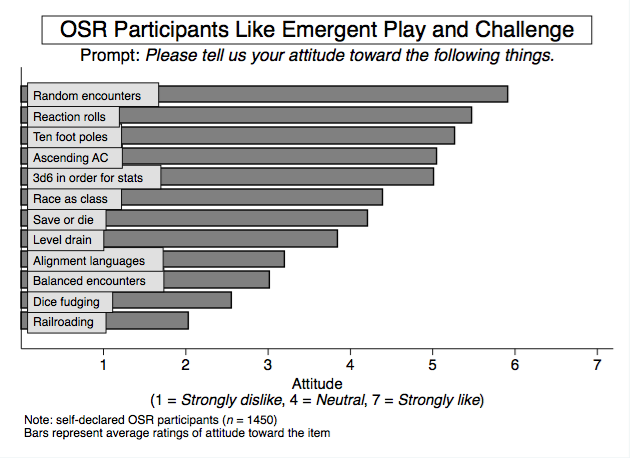 It seems that few respondents like the idea of experiencing a planned narrative, contrary to some assumptions I have seen in OSR circles, and old rules pedigree (or that related concept, nostalgia) is insufficient alone to generate positive regard among OSR participants, contrary to assertions I have seen outside OSR circles. This entry was posted in Community and tagged survey on January 18, 2019 by Necropraxis. thank you again. I think you drew good conclusions. It’s instructive to see that we all basically like the same stuff with just a little variation. It’s just good to see the 10-foot pole so well represented in both graphs…. Anyway, this is great data! I will see what I can do for a comparison figure next time I am looking at the data set. Hm. And I honestly thought my prediction that 10-foot poles would universally top the charts was going to be correct. Re: AC, I wonder if some people read “ascending” as a synonym to “improving”, rather than as an antonym to “descending”. That is, rather than a relatively static AC over the course of several levels/a campaign, that PCs should tend to get better numbers by obtaining superior armour/protective spells/enchanted gear (and similarly their opponents). There are systems where you might have a similar basic “miss chance” or other defensive capability at the start of a long campaign as the end, and would only have improved in regards to your active options to avoid damage. I am so glad to see what my gut was telling me about Emergent Play; and on both sides of the fence! A couple weeks ago, I was really struggling with my OSRIC game using a module. Even though I modified it, it was a slog and I could see myself and the group struggling to be engaged. This last week, we started a little random encounter and I decided to just “let go” and really play it out. The players really took to how things were going and all of us were able to use the environment within the module to really make that encounter rich. The players chose to keep one of the opponents alive and of course, I was able to note it for another possible encounter later. Perfect example of this. Reading this post just bubbled my feelings to the surface and supported it. Thanks. The term “railroading” seems to universally used in a negative context by tabletop gamers, so it isn’t surprising to me that it was generally disliked. Likewise, there is some gameplay where all outcomes and decisions aren’t pre-planned that isn’t emergent play in some sense. It is possible that communities define some or all of these terms differently. My sense is that there is minimal ambiguity around the term railroading, but I lack any data to back up that belief, so readers will have to make up their own minds whether the survey is measuring the attitudes of various respondents toward the same kind of thing for the term Railroading. In retrospect, it might have been informative to include a few other terms for ideas similar to Railroading but differing in connotation, such as perhaps Adventure path. If you have ideas for such items, let me know and I will add them to my notes for if we do this again. Overall, people seemed willing to report positive attitudes toward things that are also arguably often or universally used in a negative context, such as Dice fudging. Have you ever seen a discussion using the term dice fudging which was entirely positive or neutral in overall aspect? I may never have. Can you clarify or restate your second paragraph? I don’t quite follow. Dice fudging (perhaps not the specific term but the activity) is considered ok by a large number of people in specific contexts. As to my second paragraph, I think you mostly got it. Everyone agrees “railroading” is bad, a d you could likely get broad agreement on some specifics situations, but DM created “story,” “Quantum Ogres,” “Adventure Paths,” etc. would be equated with railroading by some and considered standard tools of the trade by others. Railroading has a consensus definition in broad strokes but not specifics. Likewise, emergent story or emergent play is sort of a buzz word in the OSR community, but not necessarily so elsewhere, even though it wouldn’t have a negative connotation. On average, the attitude toward dice fudging is negative in these results, which I believe to be largely representative of people who discuss games online, including self-declared OSR non-participants (see the participation post for details about potential generalizability). Our original purpose was to investigate the meaning that people associate with OSR, and we aimed the survey more at OSR spaces than otherwise, so it is possible that we undersampled the specific contexts in which you suggest attitude toward dice fudging may be more ambivalent or even positive, but I see no reason to think so (for people who discuss games online). We didn’t measure attitude toward emergent play using the term itself, so associations with that term specifically (or its status as a buzz word) did not influence the results. I use the term myself to make sense of the results, defining emergent play above as: involving the weaving of juxtaposed outcomes into a surprising sequence of fictional game events leading to emergent (as opposed to planned) narrative. I’d add here (and I think the context makes this clear above as well), that randomness heavily influences the particular outcomes that are juxtaposed in emergent play (as I use the term in this post). I think your definition is a reasonable one, but any game that uses random elements and includes a lack of absolute foreknowledge of all the participants is going to have “surprising sequences of fictional game events” presumably leading to “emergent narrative.” No Adventure Path is so entirely and obdurately pre-planned as to exclude this. Sure, it is a continuum.